The Sunny Health & Fitness SF-T1407M Manual Walking Treadmill is equipped with a 42in x 13in running belt and two non-slip side rails it will deliver enough running space and safety for those intense and long cardio workout sessions. Keep track of your overall workout goals with an easy to read LCD that displays Time, Distance, Speed, and Calories. This Manual Walking Treadmill is easy to fold and easy to relocate due to its built-in transportation wheels and folding capabilities. 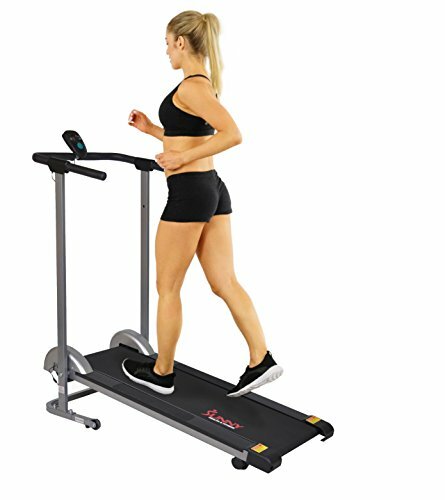 The Sunny Health & Fitness Manual Walking Treadmill is expertly designed for performance and total efficiency, with a 220 Lbs maximum user weight. EXCELLENT CARDIO BENEFITS: This affordable treadmill will help you start your fitness journey! Walking can significantly improve mental and physical health. The compact design of the treadmill will get you into shape regardless of home size. COMPACT AND ERGONOMIC: This compact, lightweight treadmill is excellent for small spaces. Running Surface: 42in x 13in. Treadmill is durable and can withstand power walking or light jogging. NON-ELECTRIC: Space saving, treadmill machine requires no electric outlet needed and remains low maintenance. Easy folding functionality and transport wheels allow easy mobility and storage.